The long ball end hex keys in this 13 piece SAE set are made from premium S2 steel for superior durability and corrosion resistance. Gray hex keys deliver up to 33% more torque than ordinary hex keys. Backed by Gray Tools worry-free lifetime warranty. Contains Sizes: 1/16" 5/64" 3/32" 1/8" 5/32" 3/16" 7/32" 1/4" 5/16" 3/8" 1/2" 9/16" 5/8". This practical 9-piece folding hex key set includes a range of SAE sizes suitable for a wide array of jobs. The unique compact design allows for ease-of-use because the hex keys do not fold on top of each other. The non-slip grip for comfort and control, chrome-vanadium steel blades and chamfered tips will make this folding hex key set the one you always reach for first. 13 Piece SAE, Long Arm Ball S2 Hex Key Set, 1/16 Inch - 5/8 The long ball end hex keys in this 13 piece SAE set are made from premium S2 steel for superior durability and corrosion resistance. Gray hex keys deliver up to 33% more torque than ordinary hex keys. 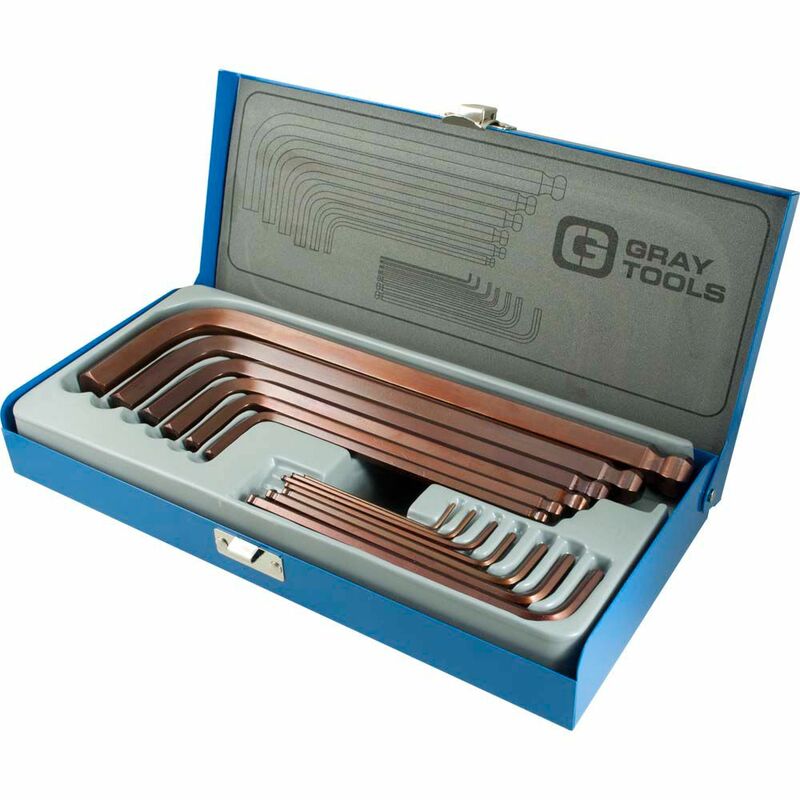 Backed by Gray Tools worry-free lifetime warranty.